Call 0800 0096534 or email. 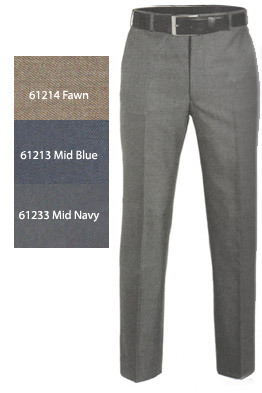 54% polyester 44% Wool 2% elastane. 340g. Stretch waistband.. Plain front. French bearer (2 buttoning and clip waist fastening). 2 side pockets and two hip pockets. Half lined. Taped bottoms. Belt included. Machine washable. Item: Magee nice classic trouser. If you see a lower price enter web site in comments section at checkout, call 0800 0096534 or email.